Amy Adams and Christoph Waltz were very good, though they both played very familiar characters: Amy Adams began as meek and mousy and transformed into mighty, and Christoph Waltz was a sardonic schmoozer. Given the many triumphant performances this year, I don’t know if I’d consider theirs to be amongst the best. And I definitely don’t understand why they’re both nominated in the Musical or Comedy acting categories. This film was not a musical and it was definitely not a comedy. It looks like we’ve got a repeat of My Week with Marilyn on our hands at the Globes this year. Pretty good, though not the best of the year. It’s about a woman overcoming the oppressiveness of not only her husband but of men in general. She’s trying to make her own in a patriarchal society, but at the same time she wants to give her daughter a life she never had. So she sacrifices her dignity and individuality so that her husband can take credit and have glory. She overcomes it, though, and finds her voice and yells out so that the whole world can hear it. 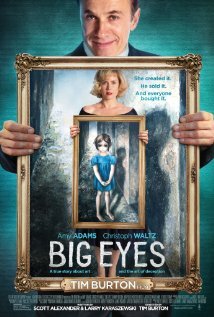 The visual effects were very minimal in this, being only hallucinations of people with big eyes, but there was something off-putting about them. And it wasn’t just the unnerving fact of being gigantic eyes. This is where the film really shone, as Tim Burton films are wont to. But it was a much more subdued version of what we are used to seeing. It was still a beautiful image to behold. Not my most favourite musical score from Danny Elfman. And I honestly don’t really care for “Big Eyes” by Lana Del Rey; it’s really hard to understand what she’s singing. And there were points where you couldn’t make out the dialogue over the music. I loved the costumes, but Amy Adams’s hair seemed to get bigger and bigger with each scene. Perhaps it’s because I’m so used to Tim Burton’s effervescent panache, but this film seemed a bit lacklustre and prosaic, enough so that it didn’t have my complete attention. A bit on the long-winded side. Tim Burton tried his hardest to tell the story of Margaret Keane, in as artful and yet simple of a way as he could. And I think, overall, it was a success.